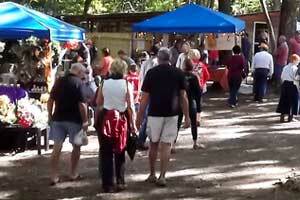 The New Salem Mountain Festival, born out of the potential for a grand celebration of human talents amidst nature’s splendor, will present the 45th annual arts and crafts show on October 12th & 13th of 2019. 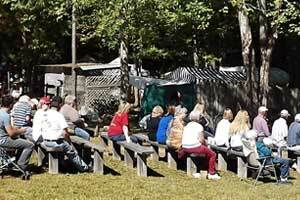 Our festival is always held on the second Saturday and Sunday of October. 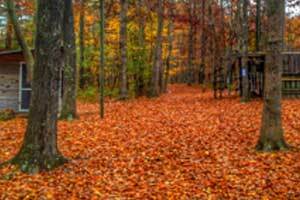 Autumn is quite evident as you become nestled in all its beauty while walking through the brilliant colored trees and breathing the cool crisp air in a beautiful woodland setting. The festival is a popular seasonal event attended by thousands of visitors each year. Comfortable clothing and shoes are recommended. 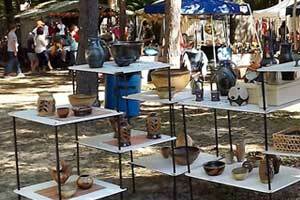 Approximately 100 talented artists and craftsmen will be exhibiting this year. Each participant is carefully screened to assure good quality products. Exhibits will include pottery, paintings, furniture, wood turning, wood carving, stained glass, jewelry, candles, iron works, wreaths, baskets, leather, purses, quilts, throws, handmade soaps, dog accessories, scarves, needlework, clothing and accessories, fabrics, chimes, jellies, condiments and much more. The special exhibition indoors each year is “The Mountain Gallery”, which features some of the best works of each exhibitor. You will also be able to purchase these items. Local ladies will be demonstrating the age old art of quilting. Live entertainment will be provided by a variety of groups. Door prizes, donated by the exhibitors, will be given away throughout each day and winners will be posted at the exit gate. The festival is sponsored by the New Salem Community Improvement Club, Inc., which is a non-profit organization and all proceeds benefit the New Salem Community Center and New Salem Fire and Rescue. NO ALCOHOL, DRUGS, OR PETS ALLOWED!